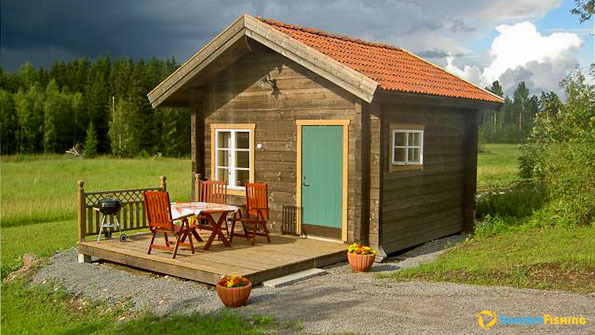 The cabin at Friskens Fiske is located in idyllic setting in Östveda outside Hedsunda. Built about 100 metres from the Dalälven River, our guests have access to a private dock, wood-fired sauna and motorboat. 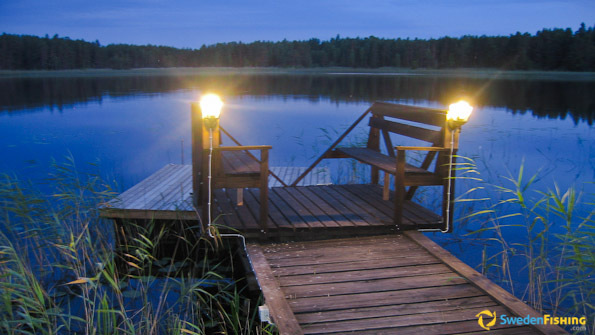 In the centre of the fishing area lies a relax site with a small cabin and a grill. At Friskens Fiske we speak Swedish and English. Open the whole fishing season. When the water is ice-free, pike can be fished from April through November. The best pikeperch season is after spawning starting around June 20 and into the autumn. Perch is at its best during high summer season from July into early September. For non-fishermen in the party we recommend such activities as the Sandsnäsbadet beach, Valbo Shopping Centre, Gysinge Bruk Mill, Mackmyra Whiskey Distillery and the Sala Silver Mine. More than 20 species dominated by pike, pikeperch and perch and with plenty of ide, bream, rudd and others. Pike over 100 cm are common and can reach 130 cm. The record pikeperch weighed in at 11.705 kg, while 1 kg perch are quite common and can reach 50 cm. Our rental boats are Linder 440 Fishing with 5hp fourstroke outboard engines, including 10 litres of fuel, life vests and sea charts. We also have Lowrance Elite3 fish finders for rent. Pike and pikeperch fishing is done from the boat. Once the ice has melted, the pike can usually be found in shallower sections until autumn. In late autumn the large pike collect in deeper water, swimming under large schools of whitefish. 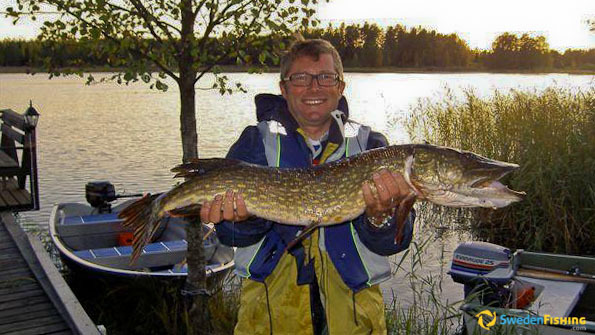 Pike and pikeperch are usually taken via spin fishing, trolling and for pikeperch, vertical fishing. The lures include large jigs, spoons, wobblers, jerk bait and spinners. Perch is primarily taken with smaller jigs, spinners and small wobblers. The number of rods is limited to two/licence and maximum of 4 rods/boat, regardless of how many are in the boat. Approved minimum measurements are: Pike: 45 cm; Pikeperch: 45 cm; Eel: 50cm. Pike longer than 80 cm and pikeperch above 75 cm must be returned to the river alive. We offer accommodation in two different cabins, a new, 22 sq.m. timber cabin with a kitchenette, shower/WC, TV, refrigerator, microwave oven, coffeemaker and a sleeping loft. There is a small patio with a grill. The cabin is locate about 100 metres from the Dalälven River. Our other cabin is newly built, 40 sq.m. with fully equipped kitchen, WC/shower, microwave oven, stereo. There is one separate bed room plus a spacious sleeping loft. Two additional persons can be housed in a 10 sq.m. large cabin on the water fitted with a bunk bed, refrigerator and microwave oven. There is a wood fired sauna next to the dock. A separate room with shower/WC is located about 74 metres from the cabin. 40 km south of Gävle, 180 km north of Stockholm. Closest airport: Västerås, 120 km and Arlanda, 130 km.